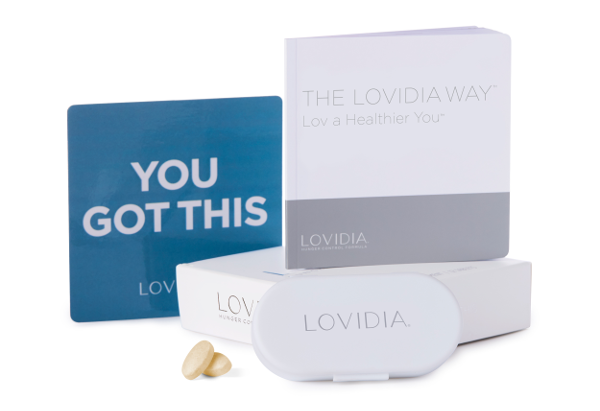 Lovidia - LOV a Healthier You! LOVIDIA is the first dietary supplement based on the patented science of Gut Sensory Modulation (GSM). Lovidia’s patented formula works with your body’s own hunger-control processes to make every bite of food you eat feel more satisfying, so you can take in fewer calories and lose weight without feeling hungry. Lovidia is simple, natural, & helps you achieve a healthier you. It gives you the power to avoid overeating & reach your weight loss goals. Lovidia is not a drug, and it doesn’t come with a long list of unpleasant and possibly dangerous side effects. It doesn’t contain caffeine or other stimulants, fat blockers or diuretics. Lovidia’s proprietary hunger-control formula contains only GRAS (Generally Recognized as Safe) ingredients, so it does not cause jitters or other unpleasant side effects typically associated with weight loss products. Tryazon will select 300 participants for this opportunity. Those chosen will receive a TryaBox with Lovidia samples to try out, review, share with others, etc.. Learn more about this opportunity by clicking the tabs below! Ever tried dieting to lose weight? You know how difficult it can be to eat less because you constantly have to fight hunger and cravings. Lovidia effectively solves this problem by helping you get more satisfaction from less food. Lovidia gives you the power to avoid overeating and reach your weight loss goals. Lovidia’s patented formula works with your body’s own hunger-control processes to make every bite of food you eat feel more satisfying, so you can take in fewer calories and lose weight without feeling hungry. See What People are Saying about Lovidia! I'm true a skeptic when it comes to anything to do with weight loss in a bottle. Not to mention, I am extremely sensitive to most of what is currently out on the market. When I heard that Lovidia was an all Natural product with no stimulants, I thought why not give it a try. I really had no expectations of it working. My main goals were changing my current lifestyle from unhealthy to making better, healthier choices (food and exercise). I kept waiting to notice being jittery or agitated in the first couple weeks; nothing happened. What I finally noticed after a couple of weeks is I am no longer having to force myself on portion control. I was beginning to feel full before I finished my smaller meals and remained satisfied for longer periods. Now instead of being famished at “snack time” I am having to remind myself to have my healthy snacks in between my meals. I am happy to report that I’m currently down 25 lbs. with the aid of Lovidia, and halfway to my weight loss goal. I keep a bottle in my desk at work, and one in my purse, and if I accidentally forget to take it – there is an APP for that! My phone sends me a reminder. I recommend this to all my friends. Why not regain your control over hunger. Lovidia has been a wonderful tool for me. I take it after breakfast. In my high stress workplace I used food/snacks to stay awake or keep focused in front of the computer. Ever since I started Lovidia my cravings have greatly reduced and I find myself drinking more water instead. Lovidia also decreases my appetite when I get caught in long meetings. I feel better at the end of my day. Thank you so much! I have been using a nutritional supplement called Lovidia for three and a half months and have had excellent results. It controls my appetite and especially my sweet tooth. I get full faster and no longer crave midnight snacks. I have lost 15 pounds during this period, and I don’t miss eating any of the junk food, such as chocolate, that I used to crave. I was a skeptic of Lovidia when a friend introduced me to it. He told me how amazing this product was, that it WOULD actually curb my appetite. As someone who's struggled my entire life with weight loss (down 110 pounds and holding steady for five years now) ... weight is something that's never far from my mind. Unfortunately, so is hunger. So when my friend mentioned this new wonder pill to me, I was skeptical. The ingredients are natural so of course, I gave it a try. I wasn't expecting anything, to be honest. I was thinking it's just one more product full of empty promises and hype. Wrong. It actually does curb my appetite in between meals. I'm one of those "bored" eaters. I'm also one of those "emotional" eaters. Sadly I'm also one of those " if the day ends in Y, let's have cookies!" eaters. This doesn't bode well for maintaining a significant weight loss. With the help of Lovidia, I'm now able to move past those road blocks, because food isn't even on my mind. I eat right, exercise, and get proper nutrition, all without the nagging hungry feeling that drove me to overeat for years. I'm grateful for this product and feel Lucky to have found it. Use #TryaBox and #Lovidia to include your tweet on this page! TryaBox sampling begins at the beginning of July! Tryazon will select 300 participants for this TryaBox opportunity. Lovidia has been a wonderful tool for me. ... I feel better at the end of my day. Thank you so much!